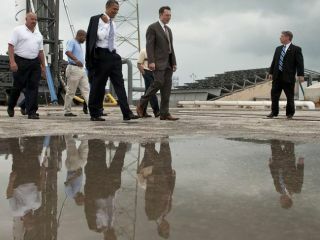 President Barack Obama walks with SpaceX CEO Elon Musk while touring the SpaceX launch facility at Cape Canaveral Air Force Station on April 15, 2010. The President stopped by on his way to visit NASA’s nearby Kennedy Space Center to deliver remarks on his planned new for U.S. human space flight. This story was updated at 1:59 p.m. EDT. The brand new commercial Falcon 9 rocket experienced anunexpected glitch just before liftoff during its first flight test Friday, stallingwhat was to be its maiden launch. The Falcon9 rocket, built by private company Space Exploration Technologies (SpaceX),was slated to blast off at 1:30 p.m. EDT (1530 GMT) from its seaside launch padat Cape Canaveral Air Force Station in Florida. An "out of limits start up parameter" caused therocket to abort launch just before its planned liftoff, SpaceX commentatorRobyn Ringuette said. "There still may be a chance to recycle the count andtry again today," Ringuette said. All systems initially appeared to function as designed,though the launch was delayed past an initial 11 a.m.EDT (1500 GMT) target by a series of issues. At first there was a problem withthe telemetry system, which enables the launch team to track the rocket fromafar. SpaceX was able to resolve that issue by moving a strongback structure onthe launch pad that was blocking the signal. Then, word came from the U.S. Air Force that a boat had strayed into the safetyrange on the Atlantic Ocean over which the Falcon 9 rocket would fly during itstrip to space. The liftoff was further delayed to allow time for the boat to becleared away to safety. Beforehand SpaceX officials said they were confident of thevehicle. "I think everyone at this point feels pretty confident,"SpaceX founder and CEO Elon Musk told reporters Thursday. "There's verylittle that we could do to improve the rocket as far as reliability isconcerned. We've done everything we can possibly think of." However, he acknowledged that malfunctions are very commonfor untried rockets and that test flights often go wrong, and predicted only a70 to 80 percent chanceof success. SpaceX's first rocket, the smaller Falcon 1, suffered threefalse starts before successfully reaching orbit on its fourth launch try. The vehicle already has a $1.6 billion contract with NASA tohaul cargo to the International Space Station, and may one day carry astronautsas well. A major malfunction or mishap could affect support forPresident Barack Obama's plan to shift responsibility for ferrying astronautsto the International Space Station to the commercialspace sector. "If they blow up on the pad, Obama's lost it,"space policy expert Roger Handberg, a political scientist at the University ofCentral Florida, said of the administration's chances of getting the proposalthrough Congress. The 178-foot (54-meter) tall liquid-fueled booster is toppedwith a mockup of the Hawthorne, Calif.-based company's Dragon capsule, which isplanned to carry cargo, and eventually crew, to space. This SPACE.comgraphic shows how the Falcon 9 rocket compares with NASA's shuttles andother spacecraft. Falcon 9 was slated to travel eastward off the pad to orbitabout 155 miles (250 km) above Earth. SpaceX has stressed that errors during a test flight arereally just learning experiences, enabling them to ultimately design a betterrocket. A glitch during a trial launch does not affect the long-term prospectsof the company or the private space industry in general, Musk said. "Tomorrow's launch should not be a verdict on theviability of commercial space," Musk said Thursday. "Commercial spaceis the only way forward," he said, because of the limited budget ofgovernmental space programs. Ultimately, SpaceX plans to reuse most elements of their spacecraftto cut down costs and make space affordable for more civilians to travel beyondEarth. "Unless we can make dramatic improvements to the costand reliability of space transport and make it closer to air transport, it willonly ever be a small number of launches that take place every year at extremeexpense," Musk said. Clickhere for SPACE.com's live coverage of SpaceX's Falcon 9 rocket testflight.